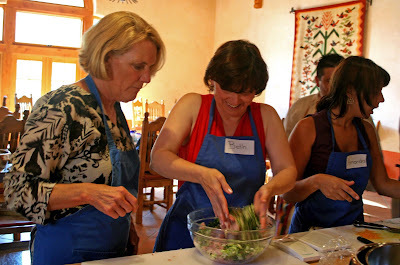 I've just returned from a week at Rancho La Puerta where cooking classes at La Cocina Que Canta topped the menu of activity options for me. Three cooking classes in as many days and each was a unique learning experience, not to mention just plain fun. I've already written about the hands-on class with Chef Jesus Gonzalez that I enjoyed in late April. I did another with him last Thursday with a Mexican fiesta theme. But I also took two classes by visiting Bay Area teacher and author Peggy Knickerbocker. One was hands on and the other a demonstration. What I came away with were not just some marvelous new recipes, but also some new products and certainly novel techniques that led to some delicious dishes. First the new products. There were three, and I found all of them intriguing. The first is agave syrup. The Ranch is big on using this as a sugar substitute, both at the cooking school and for guest meals. Also called agave nectar, it's a sweetener commercially produced in Mexico--specifically Jalisco, Michoacan, Guanajuato and Tamulipas. One reason it's become so popular at the Ranch is that it's said to be far healthier than refined white sugar. (I did, however, find a rebuttal online about its health benefits.) But, it's also a marvelous substitute for sugar and honey, especially in cold beverages, because it easily dissolves. Its consistency is a bit thinner than honey. If you use agave syrup as a substitute for refined sugar, use 1/3 of the amount called for in the recipe. I bought a bottle at the Ranch but locally you can find agave syrup at Henry's, Jimbo's and Whole Foods. Then there were Chia seeds. Actually, I found these not at La Cocina Que Canta but in the Ranch's dining room. Each morning, they sat in a small bowl next to a bowl of flax seeds. 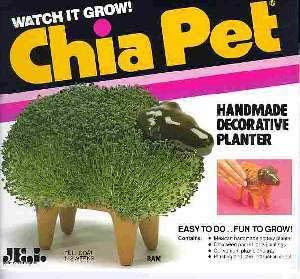 Okay, so you know the first image that pops up when the word Chia appears. I somehow missed the part that these are extraordinarily healthy supplements to a daily diet. I'm not the only one. The first person I spoke to by phone at the Hillcrest Whole Foods suggested I try calling Rite Aid or SavOn. Why? Because they sell Chia Pets there, he said. What he needs to learn is that these tiny seeds are rich in Omega 3 and full of antioxidants. Because they are highly hydrophilic (they can absorb a lot of water), they're great for athletes. They also slow down how fast our bodies convert carbohydrate calories into simple sugars, so they're a great diet helper and they're good for diabetics. You can eat them whole. You can eat them raw. If you soak them in water or fruit juice (common in Mexico and known as chia fresca), you'll find the soaked seeds develop a gelatinous texture. This mixture can be added to puddings or cooked cereals. Or you can grind the raw seeds and add them to baked goods. I added a smattering to oatmeal at breakfast and tossed some on salads at lunch. I couldn't discern any specific flavor coming from them so it's a neutral way to add some good stuff to your body. You can buy these online or at Whole Foods, Henry's and Jimbo's (when they're available). Finally, a bit of a mystery was solved about the garlic I was so excited about finding recently at the La Jolla Farmers Market. We used the same garlic this past week, fresh out of the ground. And here was the source of my confusion. Instead of a head surrounded by dry paper with a dozen or so distinct cloves, the garlic I was trying to play with was spring garlic, more like a large green onion, sans paper and cloves. Peggy pointed out that what we're used to at the market is more mature garlic that developed its papery shield as it aged. The youthful spring garlic we were using was a little juicier (like an onion), not fully developed with cloves and far milder. So, if you happen upon these jewels at the farmers market, grab them and plan to use more in your cooking than you would with older, conventional garlic. 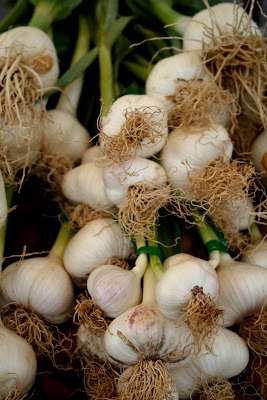 Or, try growing them yourself from cloves of garlic planted in the ground or a pot. According to The Garlic Store, it's best to plant garlic in the fall while the ground is still warm. FYI, bigger cloves equal bigger bulbs. If you want spring baby garlic, plant smaller cloves. 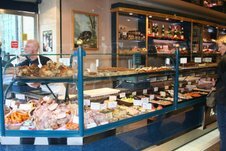 Now, I specifically chose to go to RLP to take classes from Peggy Knickerbocker because I've read her articles in Gourmet, the LA Times, Food & Wine and Saveur. 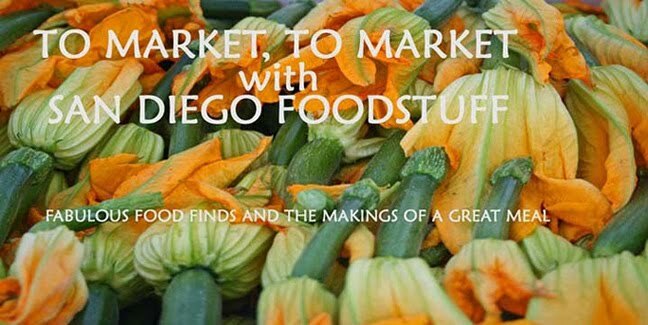 She's also written several cookbooks, including The San Francisco Ferry Plaza Farmers' Market Cookbook (with the wonderful photographer, writer and editor Christopher Hirscheimer -- also there last week), Olive Oil: From Tree to Table, Simple Soirees: Seasonal Menus for Sensational Dinner Parties (gorgeously photographed by Christopher) and The Rose Pistola Cookbook. Chop the leaves of rose-scented geraniums and add to a bowl of strawberries. You know you should toast most spices before using to bring out their flavors, but also toast whole peppercorns before grinding. Try doing this in a sesame seed roaster. If you make your own frozen yogurt, first drain the yogurt in cheesecloth or a coffee filter for at least 3 hours and up to 8 hours (toss the resulting liquid) before sweetening and adding to your ice cream machine. Eliminating the liquid means that instead of having a grainy frozen dish, you'll have the creamiest of desserts, truly reminiscent of rich ice cream. Slow roast tomatoes with olive oil, garlic, chopped herbs, salt and pepper. This is, of course, an old trick but if you're not going to use them immediately, Peggy suggested putting them in a jar and covering with olive oil. They'll last a week or so in the refrigerator. And, roast them on non-stick Silpat -- these fiberglass and silicone sheets are far better in aiding clean up than using aluminum foil. Sure, you use these on baking sheets for cookies, but they're terrific for simple roasting, too (I used one last night for roasted garlic shrimp). Use your (impeccably clean) hands instead of utensils. Use them for tossing salad to make sure greens are evenly coated with dressing. Use them to mix bowlfuls of messy ingredients. Coached by Peggy, guest Beth Masegian was utterly blissed out mixing a batch of red snapper ceviche. Finally, looks matter when it comes to taste. Think about how you're going plate your dishes -- what they're to be served in and how to arrange them in the serving piece. Peggy shared a tip that Christopher uses for photographing food. Instead of smoothing out something like a large bowl of lentil salad, let it form a more natural mound. It's a simple concept but it does look lovely. I'm an acknowledged cooking class junkie, but the three classes I took at La Cocina Que Canta have given me a number of things to think about, not only for entertaining but also just going about my normal food routines. Toward the end of each week the Ranch offers a class in "how to take the Ranch home with you." These cooking tips may not have been exactly what they had in mind, but they work for me. That's a great gift. 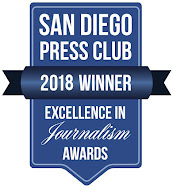 The Gourmet Club Gets Great News!